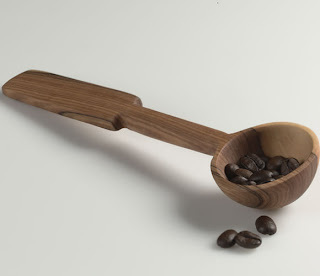 I don't now about you, but I've had my plastic coffee scoop forever and I think it's time to switch to a more sustainable--and elegant--version like this one made from Kenyan olivewood. Wood is sourced from a cut a tree, plant a tree forest. 6 inch long handle. 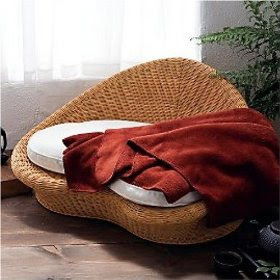 This rattan meditation chair is perfectly contoured to fit your body, making your meditation practice as comfy as possible while providing ergonomic support where you need it. Kapok filled cushion with natural cotton cover is machine washable. Chair measures 34"W x 25½"D x 19½"H; Seat height is 8"
Syndcrete is a pre-cast lightweight concrete material derived from natural minerals and recycled materials from industry and post consumer goods including include metal shavings, plastic regrinds, recycled glass chips and scrap wood. 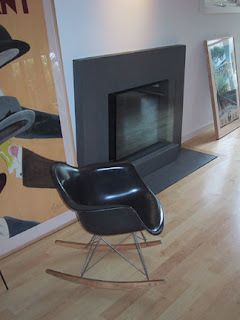 Invented by architect David Hertz, Syndcrete contains up to 41% post-consumer recycled materials. 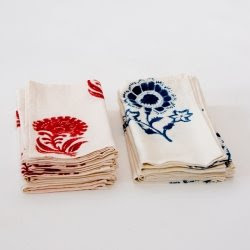 These gorgeous 100% cotton dinner napkins are bleached by the sun.The designs are printed by hand using a carved wood stencil dipped in ayurvedic dyes derived from plant roots, pulverized rock, and earth. Each napkin is unique, taking as long as 40 days to create. Set of four. 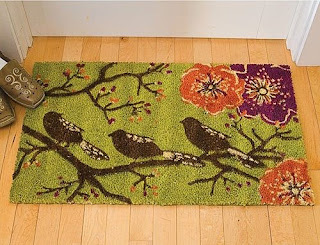 This natural coir or coconut husk fiber doormat uses natural, eco-friendly dyes to create a beautiful pattern reminiscent of the Arts & Crafts movement of the early 20th century. Measures 29.5 in. x 17.75 in. Made fade in direct sunlight. 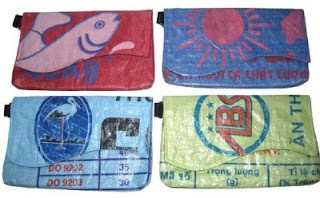 These colorful fair-trade wallet purses are made from recycled rice bags. Fully lined with five inner compartments, zippered, and six for credit cards. Made in Cambodia. 9.75 in. x 12.5 in. x 3 in. Interlocking units that you can mix and match to create a screen or room divider for your ultra mod apartment or industrial loft. 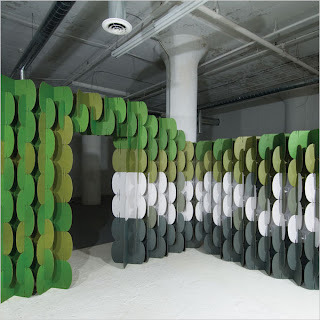 Part of the Nomad System, each 24-piece set makes a wall 3 feet x 4.5 feet in size. Multiple sets make bigger walls of course! Color choices include olive green, grass green, forest green, white, slate grey, dark grey, ochre, orange and red. Made from recycled Kraft paper in the USA, locally sourced. 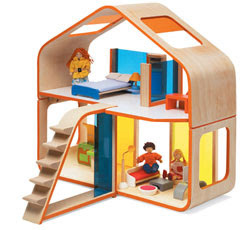 Made of recycled rubberwood, this contemporary dollhouse is the ultimate in eco-friendly, both in the materials it's made from and it's design like the two skylights. Opoen interior and moveable staircase allow easy access to the interior. Rubberwood is the tree that produces latex and is one of the most eco-friendly sources of lumber used today. 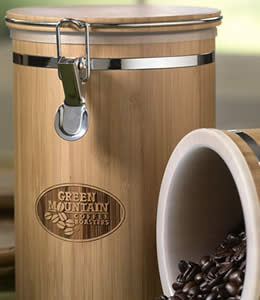 Made from our favorite sustainable material, this bamboo coffee canister is a "must have" for the coffee lover. The airtight canister has a removable food grade polypropylene liner. Hand wash. Holds 1 lb. of your favorite organically grown, fair trade coffee.